THE TERM climate refers to the long-term averages of insolation (solar radiation absorbed by Earth), temperature, precipitation, cloud cover, air masses, atmospheric pressure, winds, and cloud coverage. Of these, temperature and precipitation are the most important factors in establishing climate type. A place may have rain on one day, clear conditions for a week, and then have cloudy skies the next day followed by a hailstorm. The conditions described here would certainly be familiar to a resident of the Midwest in the United States. Daily weather variability in any given place may be quite dramatic. Or the weather may be predictably uniform from day to day. The equatorial regions exhibit this kind of weather: warm temperatures, afternoon showers, slightly cooler nights, and then the repeat of the preceding day’s weather. Whether the daily weather occurrences at a place are extremely variable or predictably uniform, it is the long-term averages of the weather factors that will be used to determine the climate of a place. Scientists in early GREECE devised a very simple and straightforward climatic system for the Earth, as they knew it. The system was composed of three zones or klimata. The zone occupied by the Greeks and other culture groups living near the MEDITERRANEAN SEA was called the Temperate Zone. This zone had temperature and precipitation values that made it ideal for human occupation. To the south of the temperate zone was the Torrid Zone, an area simply too hot and debilitating for humans to survive. At the time of the development of this climatic system, no one from the temperate zone had traveled very far to the south and certainly not to the equatorial area. Consequently, a great deal of speculation centered on the region and what manner of protection any inhabitants would have to ward off the blistering rays of the sun. There was conjecture that a resident in this region would have feet large enough to extend over his head umbrella fashion to block the sun’s rays. To the north of the Temperate Zone was the Frigid Zone, the unexplored area too cold for humans to survive. As simplistic as this three-zone system may sound today, it was nevertheless based on sound logic: Places to the south of the Greek homeland are warmer and places to the north are colder. These are true observations. However, today we can add immeasurably to the descriptions of our climatic systems and refine them to take into account even subtle changes from place to place. The “A” climates are found along the equator and are further designated as “Af,” or tropical rainforest, and “Aw,” or savanna (tropical grasslands). The “B” climates lie north and south of the “A” climates. The “B” climates are further designated as “BS,” or steppe (dryland grasses) and “BW,” or deserts. 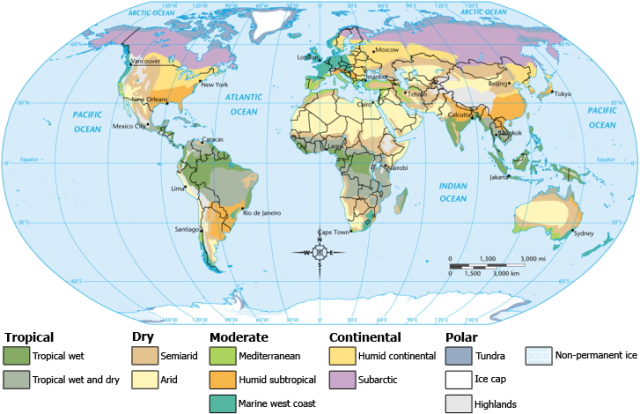 The mid-latitude climate designated with “C” has three subclimates. This is a tipoff that there is greater weather (and climate) variability in the mid-latitudes than in any other region in the world. The “C” climate is further designated as “Cs,” or Mediterranean climate, “Cfa” or humid subtropical, and “Cfb,” or marine west coast. It is interesting to note references to actual regions in the designations of some subclimates. For instance, Mediterranean climate regions are found on the West Coast of the United States, the coast of Chile, east of the Mediterranean Sea to Central Asia, and along the southern coast of Australia. These places are so designated because the climate found at their locations is identical to the climate of the Mediterranean region. The “D” climates are next. They are designated as “Dfa,” or humid continental with a hot summer, and “Dfb,” or humid continental with a very cold winter. The “E” climates are found in the polar regions. “ET” refers to both the subarctic and tundra climates. “EF” identifies the ice caps on both the ARCTIC OCEAN and the extensive sheet ice that covers the land area of ANTARCTICA. One major climatic region remains: the “H,” or highlands climate. This climatic region is sometimes referred to in the geographical literature as the undifferentiated highlands climate because the mountainous areas in which it is found have such steep gradients that several climate types may exist over relatively short distances. The patterns of climate on the Earth’s surface are displaced by latitude north and south from the equator to the poles. Tropical rainforests straddle the equator in South America and Africa and extend to the coastal areas of MADAGASCAR, INDIA, Southeast Asia, and AUSTRALIA. This is a warm and wet climate throughout the year. A climograph of the region would exhibit fairly even temperatures throughout the year and significant rainfall in every month. The equatorial belt is the destination for the converging trade wind coming from both the Northern and Southern Hemispheres. These winds reach the equator and are lifted to high elevations, where condensation occurs and rainfall is produced in abundance. The savanna regions lie astride the tropical rainforests. They are warm and moist, but their rainfall is seasonal. Consequently, the moisture received in the savannas will support grasslands and some trees but not the density found in the tropical rainforests. The “B” climates are dry. Their dryness may be due to their leeward locations on mountainous terrain or a latitudinal location far from moisture-bearing winds. The “B” climate produces either steppe (dryland grasses) vegetation or true desert. Bands of steppe and desert are found in North Africa and the west coast and interior of southern Africa and within the Rocky Mountain and Basin and Range Provinces in the United States and MEXICO. The “B” climate is also found in extensive areas of Central Asia, northern China, and eastern SIBERIA. Nearly all of Australia is in the “B” climatic zones, the interior of this continent being desert. The “C” climates are found in large areas in the Northern Hemisphere and to a lesser extend south of the equator. This fact is readily apparent with one glance at a globe. South of the equator, the land areas begin to dissipate rapidly. There is room for a bit of each of the Mediterranean, humid subtropical, and marine west coast climates in southern South America and southern coastal Australia. The very southern tip of South Africa has a mere touch of Mediterranean climate and a bit of the marine west coast. In the Northern Hemisphere, large expanses of humid subtropical are found in a band from northern India to southern China and again in a large section of the southeastern United States. The Mediterranean climatic zones, already discussed, are found on the West Coast of the United States and along the Mediterranean Sea and east to Central Asia. Marine west coast climate is found on the west coast of the U.S and extensively within the European LITTORAL and the eastern and southern expanses of the Scandinavian Peninsula. The “D” climates do not occur in the Southern Hemisphere. In order for a “continental” climate to develop, there must be a large land area within the midlatitudes. This is simply not the case in the Southern Hemisphere. So, the “D” climate is unique in that it exists in only the Northern Hemisphere where it is found in extensive areas of North America and Asia. The “Dfb” continental climate has warm summers and very cold winters. As such, the range in annual temperatures is greater than any other climate. It is not uncommon for the temperatures in northern MINNESOTA to reach 90 degrees F (32.2 degrees C) in summer and 35 degrees F below zero (-37 degrees C) in the winter. The interior of eastern Siberia has even colder winters. Verkoyansk, a city in eastern Siberia, is called the cold pole of the Northern Hemisphere with record winter temperatures reaching 120 degrees F below zero (-84 degrees C). The climates of the world influence human occupants in innumerable ways. Combinations of temperature and precipitation will impact agricultural systems and dictate the types of crops that can be efficiently grown. People living in the tundra will dress quite differently than the resident on the shores of the BLACK SEA. And there will be little use for snowplows in Miami, FLORIDA; but there had better be a number of them on hand when winter reaches Buffalo, NEW YORK. However, the commenter on climate must resist the temptation to say that the climate determines the kinds of activities that the human occupants may engage in. To do so would be to invoke the short-lived geographical theory of environmental determinism. This theory held sway in American geography during the first two decades of the 20th century. Simply stated, environmental determinism held that the environment, especially the climate, of a region determined the activities of the human occupants. It left no room for advances in technology or the ingenuity of the human occupants to overcome environmental limitations. This theory was eventually put to rest in favor of a more flexible view of humans and their environment and the realization that human-environment interaction is a two-way street. One of the regions in which agricultural origins have been traced is the highland area north and east of the valleys of the Tigris and Euphrates rivers. This highland area contains a great number of individual microclimates in its valleys and slopes. Variegated regions such as these allow for the growth of multitudes of plants within a limited area. Strains of wheat and other grains grew in these physical recesses and were eventually discovered by the wanderers and gatherers populating the region. When it was realized that seeds from the plants in the ground would produce a new plant, agriculture was originated. Climate is explained best as the combination of primarily temperature and precipitation over a long period of time. There are also examples of how the shape of climate regions can impact agricultural activity. The large and productive agricultural region in North America has a unique areal combination of temperature and precipitation. Temperature decreases from south to north in the vast interior basin of the United States and southern CANADA. Precipitation, on the other hand, increases in an east to west direction from the ROCKY MOUNTAINS to the eastern seaboard. The result of these patterns is the creation of an almost infinite set of microclimates with their own unique temperature and precipitation regime, an ideal setting for the growing of a wide variety of crops. The Fertile Triangle in the old Soviet Union is quite different. Although the region is larger than the one in North America, agricultural productivity is much lower. A large part of the explanation lies in the relationship between the temperature and precipitation zones. As in North America, temperature decreases from south to north. But unlike the North American pattern, precipitation also changes from north to south with the higher precipitation occurring in the south. The result is an agricultural system that is limited to a narrow band where the temperature and precipitation combination is ideal for the crops being grown. There is another factor at work in this relationship. As we know, temperature and precipitation patterns in the mid-latitudes can be quite variable. There may be years of drought, times when the precipitation comes too early or too late, or there is too much rain or not enough. If this happens within the relatively narrow band of agricultural land in the old Soviet Union, significant losses can occur. On the other hand, the primary North American agricultural region is displaced over a wider latitudinal band. The likelihood that the entirety of this agricultural region would be adversely affected by adverse temperature and precipitation conditions is virtually nonexistent. There may be climatic problems in part of the region but not in its entirety. The Central Valley in CALIFORNIA is an exceptionally productive agricultural region. This is explained in large part by its northsouth alignment and the variety of temperature and precipitation combinations that are available. The Central Valley is the main reason why California is the leading state in value and variety of agricultural products produced. Climates can change over time. There is geological evidence of these kinds of changes. It is true as well that human activity can bring about climatic change. A case in point is the demise of the tropical rainforest. The moisture that comes from the vast forests through the process of evapotranspiration rises aloft and is transferred north and south of the equator to the midlatitude regions. With the loss of moisture from the rainforest, there is the possibility of climatic change in the region receiving the moisture. Finally, continued melting of the pack ice on the Arctic Ocean and the great ice sheets covering Antarctica have already increased the mean temperature of the Earth a small amount. In time, considerable changes in climate could occur, not to mention the possible flooding of populated places worldwide as ocean levels rise.